I am Amawari of Katsuren. That is the practice of this world. This is a world in which I want to live. Let us go to play and pray. It will be the best day. Let us go to the field and play. Get ready to go with this in mind. 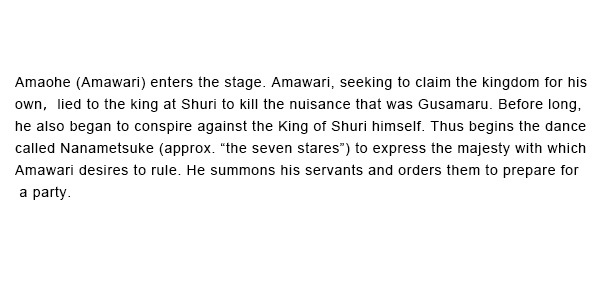 At the time of surrender, the fallen Gusamaru's two orphaned children, Chirumachi and Kamechiyo, enter the stage. The two children had grown up, and were looking for the chance to take revenge on their father's enemy. One year, the two children heard that Amaohe was to go on an outing and resolve to pay a visit to take the opportunity to revenge. The two then go to their mother and receive permission to take revenge on their father's enemy. Thereupon, they receive a short katana owned by their late father Gusamaru, and bid farewell to their mother. The trees and grasses know. Is it okay not to know one's parents? And we have become twelve and thirteen years old. Let us take our revenge. Our fame will live on. The enemy of our father. And take revenge, I think. But to bid a sorrow farewell. Today is the day I shall pass it down. And do not be careless with it. Part from our beloved mother. Today for sure we will take our revenge. I will be forever reluctant to part from you. It is very hard to part. It will be expressed on your face. Let us contemplate (to overtake our enemy). The trees and grasses have begun to sprout. What joy it is to play. And the slight breeze is cool. Let's drink and have fun. I will now pour the sake. The leaves will fall to the Earth and return to the soil. Will again turn a beautiful color. So much fun to see them blossom. Call them here, call them here! And show him your dance! We are celebrating such a wonderful spring. I pinch myself, I must be dreaming. Ooh, so beautiful, so beautiful. I want you to take this, too. I will give you this, too. I shall try and pour the sake. To pour the sake, What a splendid thing! Seems all the more savory! Pour the sake, Pour the sake! How much we have drunk! Show us more of your dance! Will the budding flower bloom? Aah, so beautiful, so beautiful. Let them take this, too. Yes, let us give them this, too. Get back, get control of your hasty heart! Are splendid compared to rest of the world! Even if I sleep, I cannot forget. That we have taken vengeance upon. And dance our way home! Let us dance our way home! That meet the morning dew. 이대로 영원히 헤어지게 되는 것일까? 다시 만나 뵐 수 있을까?